Episode 199 covers the astrological forecast for April of 2019, with astrologers Kelly Surtees, Austin Coppock, and Chris Brennan. 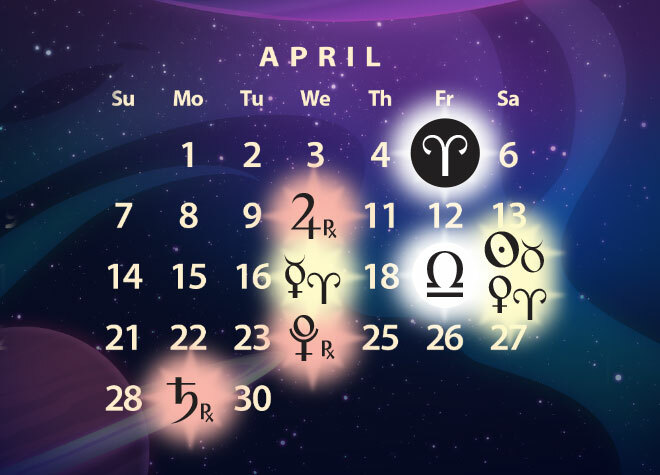 The forecast for April features a grand fire trine, three outer planets stationing retrograde, and Mercury finally leaving its retrograde shadow and moving from Pisces into Aries. At the top of the show we spend just over an hour catching up, talking about Chris and Kelly relocating, the podcast reaching episode 200, astrological ethics, and other topics. Below you will find the show notes, followed by links to play the audio or video versions of this episode. Voting for ISAR 2020 conference speakers begins today! Please vote for us! Chris, Kelly, Austin, Leisa, etc. ISAR members should have received their ballots via email already. Chris and Leisa moving to a new apartment, with new podcast recording studio. The Astrology Podcast hitting episode 200 in April! Deciding what topic to do to mark the occasion. Kelly is presenting a webinar on fertility in astrology on April 6, and talk on the Jupiter-Saturn cycle in mid-April. Austin has just released the schedule for his astrology classes in 2019! Get early access to new episodes of the podcast and other benefits by becoming a patron of The Astrology Podcast on Patreon. Our 2019 astrology calendar posters are now on sale for $14.95 on Amazon. There are a few more electional charts that we found for April, which are available in our private subscriber-only podcast on auspicious elections that was released a few days ago. We finished the pre-forecast banter and started talking about the astrology of April at around 1 hour and 8 minutes into the show. I bought a house around when Uranus went into Taurus. I exchanged contracts and completed in June 2018. However the stress of the back and forth was going on in March to May. I see that more as my pluto transit as it went into my 4th and was trining my moon and Saturn (Saturn rules the 4th) so it is difficult to know what Uranus in Taurus means for me. I have had planned to set up my therapy room and work from home which is done now so that could be the correlation and generally feeli g more settled in my new area. It all happened quite quickly too (I have natal Taurus opposite Uranus …but mid degrees). By whole sign Uranus in 8th would go into 8th and I did get gifted some money to help with my deposit. Very interesting about St Patricks Day and Venus, hadn’t thought of that. And Ireland is a Taurus country, Venus-Green, slow, beautiful, musical, and run by the banks… Of course that’s only the chart from 1916 Uprising but it sure fits. I had always assumed that the christian takeover of pagan festivals was the reason behind that date, 17th March. The Roman church shifted all festivals a day or two forward or backwards, presumably because they couldn’t stop people celebrating these natural points on the yearly wheel but still they wanted to make some kind of statement and/or perhaps mess with the natural power of these moments. At this latitude (ca 51 North) the 17th is often the 24 hour period of equal day and night. The exact moment of sunset is hard to judge of course because of refraction from the setting sun so I am only going according to astro.com.